Amidst all the hustle and bustle of the rapidly growing Rocks brewery is a rack of wine barrels, full of beer, which had been sitting for 12 months in the middle of the brewery floor just quietly taking everything in. 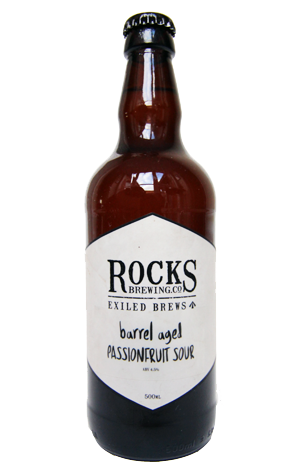 The contents of said barrels are now starting to appear in bottles under a limited edition Exiled Brews series with the first (and technically second) to be released being Carol and Beryl, a pair of passionfruit witbiers named for the barrels in which they were raised. But these twins, despite coming from the same stock, have had quite separate upbringings, with half of the brew going into a Chardonnay barrel and the other half into a Cabernet Sauvignon barrel. The kicker is that no one’s quite sure which one is which. In any case, despite being called Carol and Beryl, a more appropriate name for the beers might be Brett. Both are chock full of Brettanomyces which adds its unique twist to proceedings and, having had a year to chomp away at the sugars, a certain dryness to each beer. With a very rare, all wheat base, there’s not too much to mask the musk, save for the passionfruit which comes through increasingly as you progress down the glass, though it’s never going to offer the tropical punch of, say, something fuelled with Galaxy hops. The beers may be labelled sour, but they’re rather more about the Brett character and a little acidity and zesty citrus peel bite rather than lip-puckering sourness, with oak and tannins coming in behind to build common ground with a fruity, oaked white wine. There may be some marked differences between the two, just as there are similarities, but what rings true for both is the more time you spent with these siblings the more interesting they become.